This close-up of Winnersh shows Reading Road from a point near the Loddon Bridge roundabout southwards. 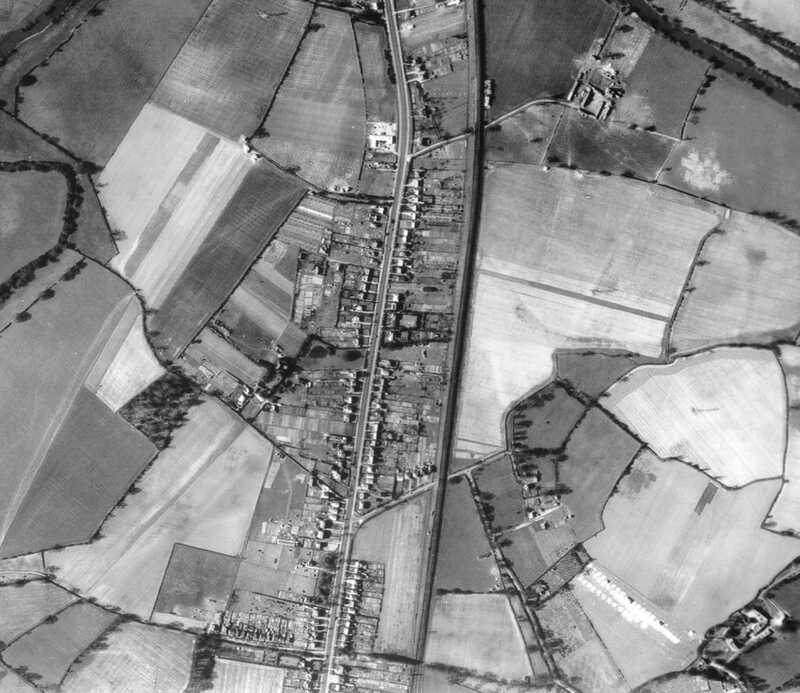 In 1944, the built-up area was more or less confined to ribbon development along the main road, attracted in the 1920's by the regular bus service between Reading and Wokingham. Every square inch of the back gardens seems to have been devoted to growing vegetables. From the top right, the first road off to the right is now Cavendish Gardens, with a pedestrian link to Winnersh Triangle station and the industrial estate beyond. Many of the back gardens have now been built-on, becoming Verbena Close, Albany Park Drive and Turnstone Close. The Methodist Chapel can be seen, set back from the road. The second road to the right is Arbor Lane, which now serves a whole network of roads including Bathurst Drive. In 1944, the Forest School wasn't built. The field marking its northern limit can just be seen. To the right of Arbor Lane is another field now used by Forest School; back in Spring 1994, it looks as if it was being used for Army manoeuvres. To the west of Reading Road is Westfield Road, divided in the 1960's into two parts by Chatsworth Avenue. This in turn allowed more fields to be developed as small estates and mobile home parks. The field that is now Rainbow Park is right at the bottom of the picture.